When we say Chinese New Year, every Filipino would instantly be reminded of tikoy, hopia, and angpao! Well, a large part of the Filipino culture is inspired by Chinese. There is even a running joke that every Filipino has a trace of Chinese blood in them. With that said, it is given that even non-Chinese Filipinos do celebrate Chinese New Year. For this year’s celebration, I joined Fruitas Holding’s Le Village Lifestyle Park‘s celebration of the said event. Good Food and Pretty Place? Oui! When I received the invite from Fruitas Holdings to join them in their Chinese New Year celebration, I was a bit hesitant because of the location. I am from Makati and I am totally unfamiliar with it. Luckily, it can easily be found on Grab or Uber. I arrived early for the ribbon-cutting attended by Fruitas Holdings Executives and Quezon City Vice Mayor Joy Belmonte, so I took the opportunity to take some photos of the park. Open-air area for a comfy dining experience! Pretty place and good food? Anybody up for some Mexican-Filipino cuisine fusion? Enjoy the pretty fountain at Le Village. It is average-sized and can house up to hundreds of guests at a time. At the time, there are 14 concessionaires offering various cuisine. The one that caught my eye was Sabroso Lechon. The open air setting of the location is perfect for a great and fun dining experience. The best part is it is very Instagrammable! Le Village took its aesthetic inspiration from a French villa- pure and clean with a fountain as its centerpiece. Diners looking for good food and a pretty place need not to look any further! 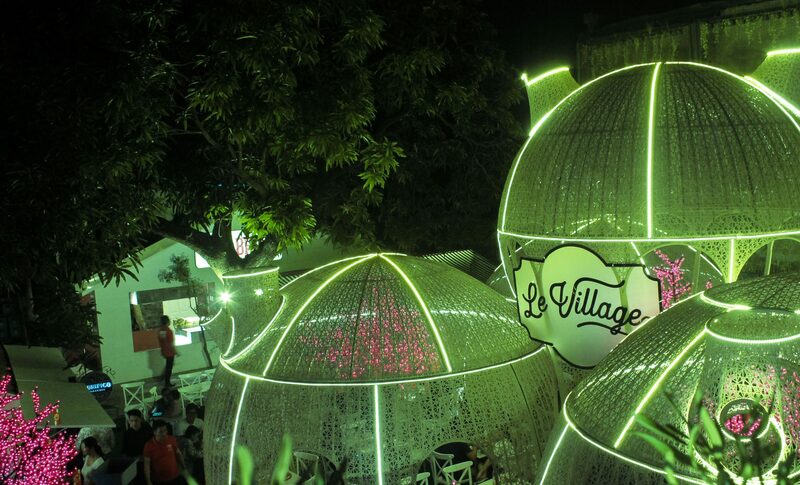 Last February 16-18, Fruitas Holdings Inc., celebrated Chinese New Year with a line-up of fun activities at Le Village. Among their activities is the Bring Your Dog contest. It is not a secret that I love dogs and that I have three back home. I had a great time covering this part of the event because cute, dressed up pooches walked around the food park. Most of the dogs wore Chinese costumes since 2018 is the year of the dog! Guests who brought and dressed up their dogs had their photos taken at a booth and while the best ones won special prizes!